Welcome back to What I'm Wearing, your weekly peek into what the editors of Wareable are wearing on our wrists. We get a lot of wearables and accessories here at Wareable, and we have to put them through their paces. It could be a new strap, a smartwatch, or even a fitness tracker. Sometimes it's a device we're testing, other times it's just something we happen to be wearing. Plus, we just really like talking about wearables, okay? If you've got some recommendations for us, don't hesitate to send them our way at [email protected]. You never know, it could be featured here one Tuesday! I'm back on the Garmin train, and having taken the Fenix 5X Plus for a test, it's now the turn of the family's smallest member – the Fenix 5S Plus. Yes it looks just like the 5S original, but look closer; that display is actually a bit larger to accommodate the topographic maps that now come loaded with the Plus variant. For daily wear the 5S Plus is much more my style. I know I have twig wrists, but even the most hulking forearms might find the 5X a little overbearing. So it's great that you can go for a smaller option and not lose out on those lovely rotatable maps. As for the watch face, I'm using the Rings Pro face by ftrimboli, which you can find on the Garmin Connect IQ store. It shows my activity around the outsides and heart rate in the middle. Most importantly, it's nice and colourful. The Misfit Command is the second watch to emerge from the company after being bought by Fossil and, boy, is it obvious. This thing is very unlike other Misfit watches we've seen. It's got a wonderful style to it. A nice silver ring outside the watch face, a matte finish on the sides. Two extremely solid buttons on the left side. This is a well crafted watch, and at times it purely feels like jewellery. The one spoiler is that the band is silicone rubber, which betrays that beautiful face. 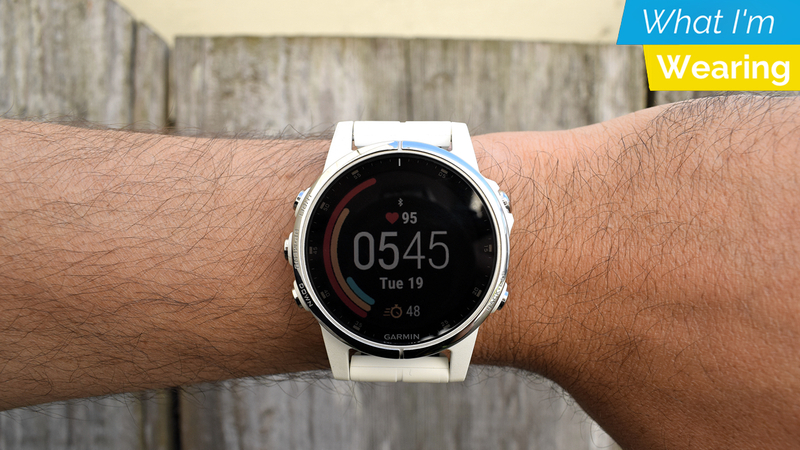 All of this style is hiding a hybrid watch that sports swim tracking, movement tracking, sleep tracking, notification support, a world clock and more. It's got a lot of smarts, but in the first few days here I'm enamoured with the looks. Hopefully the smart features measure up.